Course outline: Learning to use 2-hole beads opens up your beading horizons! In this class you will learn how to do peyote using 2-Hole beads, such as Diamond Duos, Silky beads or SuperDuos. Students will see examples the stitch using different beads and learn about considerations for each bead type. 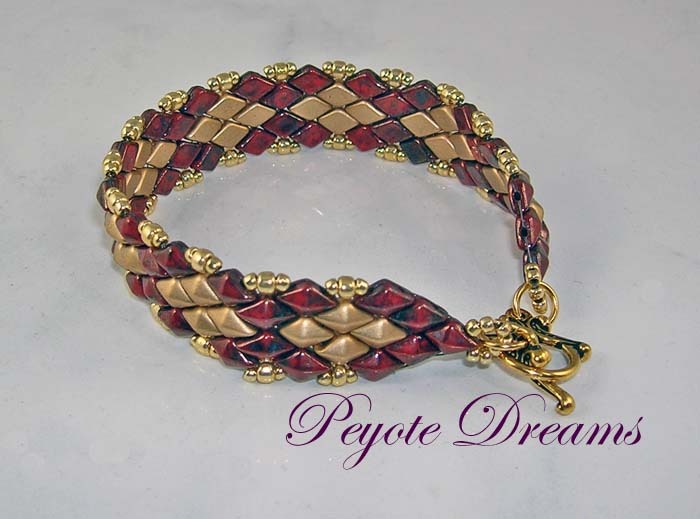 Don’t worry if you haven’t worked with the peyote stitch before – you won’t have a problem! This class will cover even and odd-count turns using the two-hole beads. It will not focus on creating or reading patterns. The class will be technique driven and all the materials you need to learn the technique, with written instructions, will be included in the class fee. You will then apply the technique to a bracelet project using two-hole beads of your choice. Any materials needed for the projects will be your responsibility to purchase but are readily available at BeadFX. Bring to class: Students will need to purchase their own beads and findings for their projects as well as needles and thread/Fireline. Extensive written instructions for the basic stitch and project instructions.